Invite hours of afternoon lounging with this handmade hammock made by artists in Thailand. A spacious retreat for one, the hammock is woven extra wide so it can also accommodate two loungers side by side. It's designed to support a combined weight up to 400 pounds, and comes in a handy tote bag made from repurposed nylon. Handmade in Thailand. 6' L x 7.5' W; supports up to 400 lbs. Weather safe; If needed, hand-wash. in cold water with non-bleach detergent. Secure scale lines to prevent entanglement. Rinse thoroughly and hang to dry. Great bold colors. Delicately hand made, so relation is encouraged no watches or rings or anything that could snag the workmanship. Outdoor gift;it's raining in Calif. not able to use until the weather clears. From photo and description the recipient is thrilled, eager to use hammock. I bought this as a birthday present for my husband and it has gotten some great use from the whole family! It is very comfy and more roomy than I expected even. We liked it so much that we got a second for the backyard to create a little oasis. Easy set up between two trees and the other on an old hammock stand. Husband loves the colors and design! 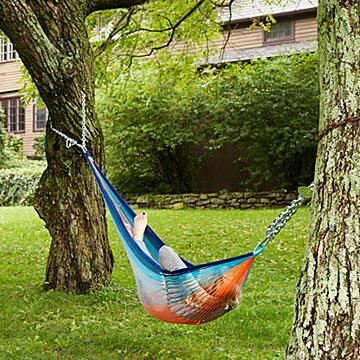 I've been looking for a replacement hammock and this one caught my eye. Previous hammocks were cumbersome and looked dingy if left out in all weathers. This one is light-weight, so easy to hook up at a moment's notice and to take down when inclement weather threatens. I bought some high quality Hammock Straps to use with this product. It's such a comfortable hammock and now our go-to spot for relaxation in our garden. I like the back story of its production, too. Beautiful, vibrant colors! Great, comfortable design. Appreciated the thorough setup instructions and the range of heights/widths this particular hammock would work with since we already had the hardware setup. Was shopping for a gift but stumbled upon this hammock, so decided to get something nice for my backyard as I've been on the lookout for a good quality hammock. The color on this hammock is very vibrant, much more gorgeous in person than in the pictures here, and really well crafted too! Amazing story and love how this company is having a positive impact on the artisans who make them and creating a fantastic product! Bravo! Highly recommend this hammock, and will be getting this as a gift in the future. Fantastic hammock, just as described.